With more than half of the season in the record books, the Tech volleyball team has a chance to do something it has not done in five years — make an appearance in the NCAA Tournament. Sitting at No. 8 in the ACC after their win against Virginia Tech in Blacksburg last Sunday, the Jackets’ remaining schedule leaves them poised to make a run to the top of the ACC standings and into the national spotlight. Having already played Atlantic Coast Conference juggernauts Florida State, Miami, Louisville and Pittsburgh, Tech will find itself favored to win in the majority of its remaining games. Beginning today and Sunday with home matches against North Carolina and North Carolina State, respectively, Tech plays nine straight matches against nine seemingly beatable opponents. However, after this stretch of games, Tech will be faced with some staunch competition. For now, Tech’s nine upcoming matches should be where their focus lies. Today’s match against the University of North Carolina is going to be the toughest out of the Jacket’s next nine outings. Though the Tar Heels are No. 29 in the nation, which does not bode well when compared to the Jackets’ No. 81 ranking, the Jackets match up well with this team. North Carolina wears down its opponents with long rallies and better stamina late into the match, but the Heels have difficulty developing their rhythm when playing from behind. If the Jackets can jump out to an early lead, UNC will be unable to get into its groove. Additionally, the match is being played during homecoming at Tech, which will provide a loud and raucous crowd looking to cheer on the Jackets and disrupt the Heels. From Sunday’s match until Nov. 20, Tech will play seven matches versus opponents who have a combined conference record of 13-45. These seven matches will give the Jackets the opportunity to fine-tune their abilities, get more game and team experience and, above all, get seven potential wins that will improve their record into that of a tournament caliber team. 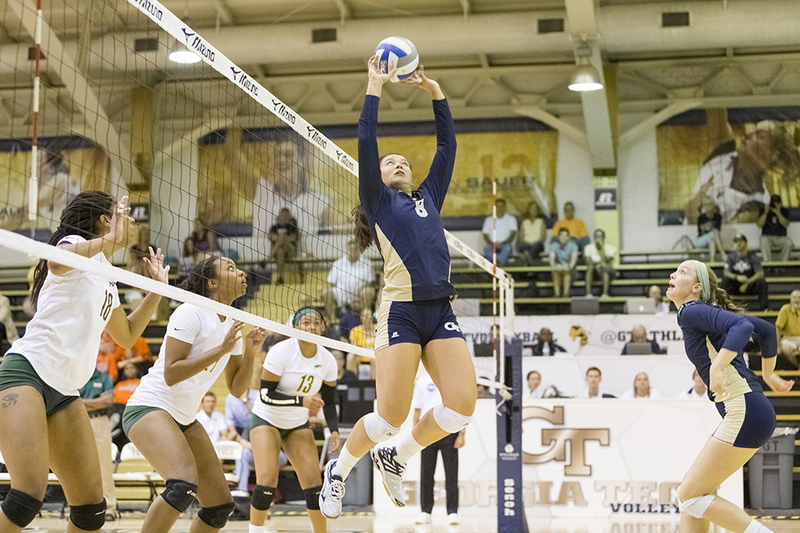 In addition to this seven-match stretch, the Jackets will face a challenge on the Oct. 30 when Tech travels to Syracuse, N.Y., to play a 15-4 Syracuse team, who, like Tech, also has tournament intentions. The Syracuse match promises to be interesting, but the Jackets will play hard and determined, looking to increase the likelihood of a possible tournament appearance with a big conference win over the Orange. After Tech completes this stretch of nine games that hopefully result in nine victories, the Jackets will end their regular season with a daunting three-game stint. Over a span of five days, the Jackets will play at No. 16 Louisville, at home against No. 18 Florida State and at home against a talented Miami team. To make matters worse, Tech has already faced each of these teams once earlier this season, losing each time 3-0, 3-0, and 3-1, respectively. If the Jackets can execute to the best of their ability over the next nine games, they may have the momentum and confidence necessary to pull off an upset or two in their last three games. A victory against Louisville, FSU or Miami late in the season would present a compelling argument in favor of the White and Gold to the NCAA Tournament Selection Committee and could give the Jackets the win they need to bring postseason volleyball back to Tech for the first time since 2010. In a season that has already charged the emotions of players, coaches and fans with more than enough excitement, the team knows that the road ahead could be even more electrifying if all goes according to plan. With a spot in the NCAA Tournament in their sights, Tech volleyball will be putting the blinders on in order to achieve the incredible and finish the season strong with an onslaught of wins. The next nine games give the Jackets time to manicure their talents in preparation for those three big matches to close out the season. Volleyball fans are beginning to believe that for this year’s team, glory beckons.